Hatboro Federal has been committed to its customers and the communities it serves for more than seven decades. 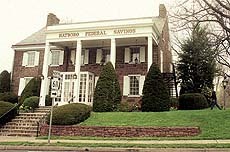 Hatboro Federal was chartered by the Federal Home Loan Bank Board on February 3, 1941, with $25,000 in assets—the minimum financial requirement at the time. We issued our first home mortgage loan two months later—on April 17, 1941—in the amount of $4,500 for a home purchased in Hatboro. While Hatboro Federal has been helping put people in their own homes, we did plenty of moving ourselves in the early years. Our first home was at 39 South York Road. On September 10, 1942, we moved to 214 South York Road, then in May 1947 to 121 South York Road. Hatboro acquired the John Harrison House at 221 South York Road, renovating the interior and exterior of the historic 1742 structure. When it opened on April 26, 1951—as Hatboro Federal Savings—it became an immediate landmark in the community. Our continued growth and success motivated us to expand into nearby communities. Our Warminster office—a new structure at 609 York Road—opened on March 17, 1960. Our Warrington branch at Bristol and Easton Roads opened in the historic 1799 John Barclay House on April 9, 1964. An extensive addition was built onto our main office in Hatboro and completed in 1978. When we realized we could not salvage the neighboring historic Potts House we acquired at 229 South York Road, Hatboro Federal undertook an historic replication that was completed in 2000. It now houses our loan department. We opened our fourth branch office at 2523 York Road in Jamison on October 19, 2009.